The technique relies on manipulating what is known as the orbital angular momentum of the waves. Recent work suggests that the trick could vastly boost the data-carrying capacity in wi-fi and optical fibres. The striking demonstration of the approach, reported in Nature Photonics , is likely to lead to even higher rates. Angular momentum is a slippery concept when applied to light, but an analogy closer to home is the Earth itself. Our planet has "spin angular momentum" because it spins on its axis, and "orbital angular momentum" because it is also revolving around the Sun. 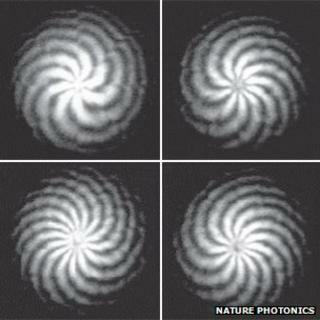 Light can have both these types, but the spin version is the more familiar - it is associated with polarisation, or the direction along which light waves wiggle. Polarising sunglasses and many 3D glasses work by passing one polarisation and not another. In many data-carrying applications involving light, more data is packed on to light waves by encoding data streams on different colours of light. But light of each colour can also be made with two different polarisations, meaning twice as much information can fit within the same "bandwidth" - the range of colours that the transmitting equipment is able to process. Orbital angular momentum, or OAM, on the other hand, has only recently come to the fore as a promising means to accomplish the same trick. The idea is not to create light waves wiggling in different directions but rather with different amounts of twist, like screws with different numbers of threads. Most recently, Bo Thide of the Swedish Institute of Space Physics and a team of colleagues in Italy demonstrated the principle by sending beams made up of two different OAM states across a canal in Venice, an experiment they described in the New Journal of Physics . Most data traffic in optical fibres around the world is made up of different data streams on slightly different colours of light, which are split into their constituent colours at the receiving end in a technique called multiplexing. To fully realise OAM's potential, similar multiplexing of different "twists" must be developed. Alan Willner and his team at the University of Southern California, along with colleagues at Nasa's Jet Propulsion Laboratory and Tel Aviv University, have now demonstrated one way to do that. The team prepared two sets of four light beams, each with a set level of OAM twist, and each of the eight containing its own data stream. The two sets were then filtered to have different polarisations, and arranged into a single beam with four streams at the centre and four in a doughnut-shape around the edge. At the receiving end, the process is undone and the single beam was unpacked to yield its eight constituent beams, together carrying about 2.5 terabits per second. Initial experiments were only carried out over a distance of about a metre, and Prof Willner said that challenges remained for adapting the approach to fibres or for longer-distance transfer. "One of the challenges in this respect is turbulence in the atmosphere," he explained. "For situations that require high capacity... over relatively short distances of less than 1km, this approach could be appealing. Of course, there are also opportunities for long-distance satellite-to-satellite communications in space, where turbulence is not an issue." Commenting on the work in an accompanying article in Nature Photonics, Juan Torres of the Institute of Photonic Sciences in Barcelona wrote that it "contributes a new chapter to the long history of telecommunications by demonstrating the potential of OAM... for increasing the transmission capacity". However, he said that for wider application, a number of robust tools would be needed to manipulate OAM states and to create and deliver beams made up of several of them. "The true impact of this development in the telecommunications industry will depend on how several important issues... are addressed and solved," he wrote.